One of the great joys of Freemasonry, for me, is in finding extraordinary beauty in ordinary places. After all, finding the deeper meaning behind everyday symbols is a large part of what modern Masonry was founded on; we took the tools of the common workman and turned them each into a symbol for self discovery and self improvement. Surprisingly, once you begin that search, you’ll find yourself tripping over educational opportunities everywhere you look, and constantly widening the scope that your search covers. Which brings us to The Lion King. I was bored one Saturday, which is how far too many interesting stories start. In the past, this would have found me sitting on the couch, book in one hand, remote control in the other, looking for decent background noise to read to. This being 2015, the future we were all promised by Robert Zemeckis, I was sitting on the couch, laptop on one knee, Netflix on the television, looking for decent background noise to browse to. Progress! 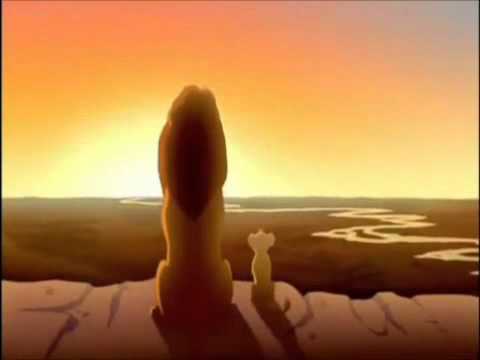 As my eyes were skimming across “B-Grade” horror movies and 80’s action movies (hey, I never claimed to have good taste), trying to find a movie that wouldn’t require too much of my attention, one movie stood out that just didn’t fit in: The Lion King. It was a movie I hadn’t thought about in years, and I probably wouldn’t have given it a second look on most days, but I was feeling very nostalgic and maudlin, so I decided to press play. Of course, this isn’t the story of why that’s one of the few Disney movies I can tolerate, nor a scene-by-scene description of me watching it. Instead, it’s an opportunity for me to show that Masonic inspiration can come from unlikely places. That scene came on and my head whipped up so fast you could hear my neck pop. I quite literally rewound and replayed that scene half a dozen times. If they were monitoring my usage, I imagine someone at Netflix thought that a toddler must be playing with the remote control. As Freemasons, the light itself is our kingdom. The truth, goodness, and warmth of the pure light is not only our constant joy, but our responsibility to uphold and protect. That light is what enables us to improve ourselves, and isn’t it our job to spread light as far as we can? Not through preaching or proselytizing, but through our lives and actions toward others. As for the shadowy place, that represents those things which, as Masons, we should never do. Of course, just a few scenes later, the young cub finds a way to go directly to the place he knows he shouldn’t go, and it nearly kills him. I wouldn’t be surprised if more than once a Mason has found himself at risk for doing something that he knew he shouldn’t. In Masonic terms, there is a point within a circle, the borders of which we must never allow our passions to take us past. The specific symbols we used may have been different from Disney’s, but the meaning behind each is the same; control yourself, keep your passions within certain boundaries, and remember that you put yourself at risk if you cross those boundaries. As a bonus, there was one line of dialogue in between those two that I skipped, but would like to revisit. The adult lion tells his cub “A king's time as ruler rises and falls like the sun. One day, the sun will set on my time here, and will rise with you as the new king.” What if, instead of “king” we said “Worshipful Master”? Is not our time as ruler of the lodge equally short? I could probably write a whole book on Masonic allegory found in Disney movies, but that wasn’t the point. My goal was simply to get you to start looking for allegory in unexpected places, and using it to broaden or refine your current understanding, and if I’ve sparked an interest in you, I’ll consider this a success. Great post. Another movie I watched that I thought had all kinds of Masonic allegory was The Croods. There is another Masonic symbol hidden in this movie. Check out Rafiki (the baboon) is holding.